I think it’s pretty safe to say that I have bathroom makeovers on my mind right now, since I’m working on my own small bath makeover. I love to see what other bloggers have done in their homes…in real homes, with reasonable budgets and a DIY attitude. Click here to check out all the details and lots more pictures of Miss Mustard Seed’s bathroom makeover! 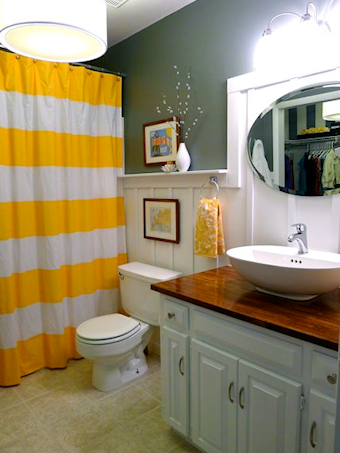 This light and bright guest bathroom makeover from Beneath My Heart is an absolute showstopper! 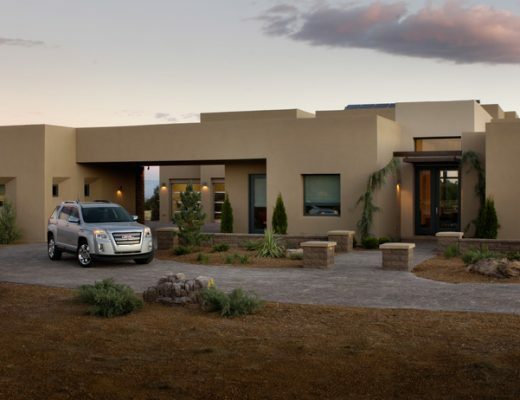 It started out kind of dark, with outdated fixtures and finishes, and turned out so beautiful, with so much character. 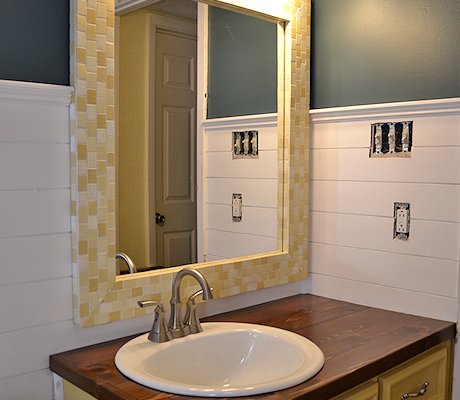 Click here to see more pictures of this bathroom makeover. 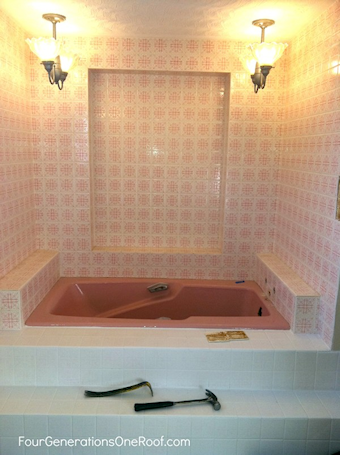 Jessica at Four Generations One Roof absolutely transformed this outdated bathroom in a beautiful, updated room. The other side of this room is equally impressive, so be sure to click here to see the whole makeover. 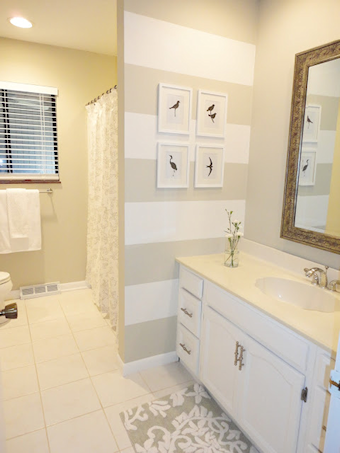 You know I’m a sucker for stripes, so naturally I love this bathroom makeover from Live Love DIY! 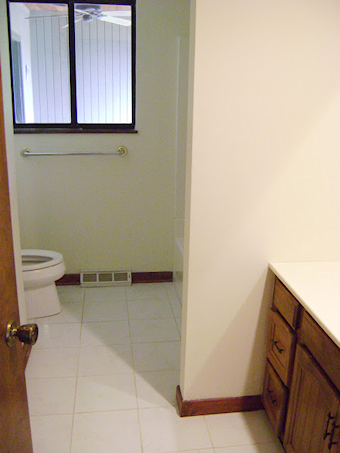 See more of this bathroom before and after right here. 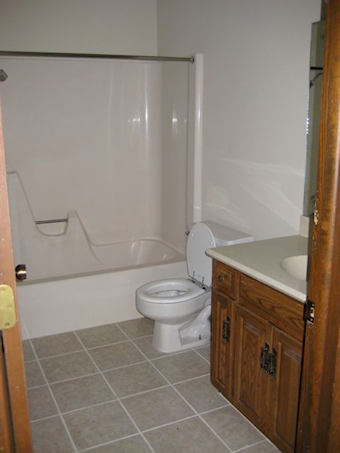 There’s lots more to see of this bathroom before and after right here. 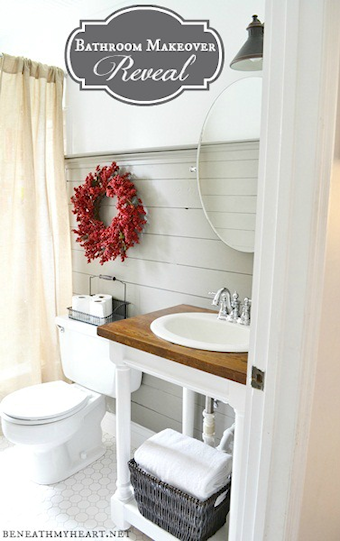 Do you have an amazing DIY bathroom makeover of your own? If so, and you’ve shared pictures online, leave a link in the comments below! I’ve love to see them! 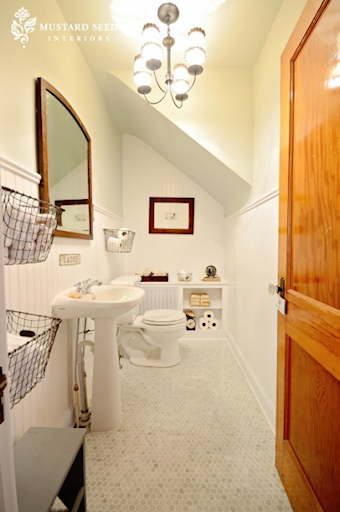 Next Post Wainscoting: A Classic Or A Trend? Wow, Kristi! I’m so honored to be included among such talent!! Love all of those bathrooms, and can’t wait to see what you do with yours! I know it will be a showstopper! Have a great day! These are all truly ‘great’ bathroom makeovers and I will take more time this weekend to really look each one over. We need to redo both of our bathrooms and there are some great ideas to inspire me. Thanks and I’ll be exploring other links as people post them. wow, I love a good before and after! I need to do something to my bathrooms! THanks for your comments on the hangout tonight! Oh I think it would be beautiful to see some of that gold in there, I bet it would warm up the bathroom and be a lovely compliment to your color scheme! I like how most of these examples tend to make the bathroom brighter. 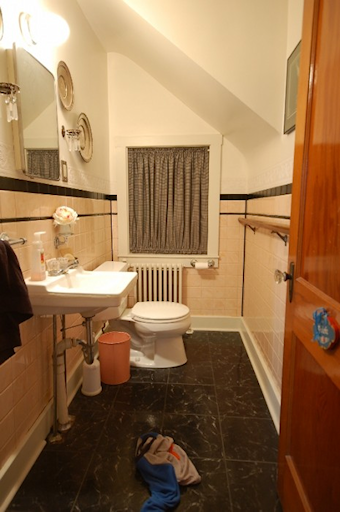 In the 80’s and 90’s bathroom were just considered bathrooms, but it’s good to see how bathrooms are now considered part of house and can be decorated just the same. 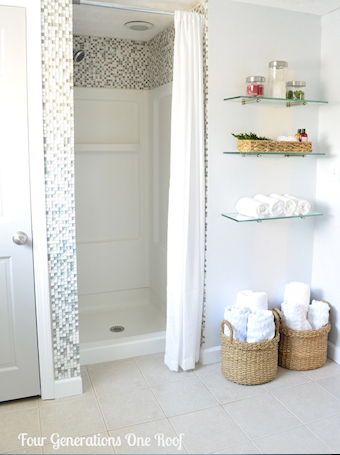 Fabulous bathroom makeovers! I haven’t figured out what to do with our master bath since we moved into this house. I’m pretty satisfied with the changes we’ve made in the other rooms, but the bathroom has a old world plaster glazing treatment with flor-de-lis stamped in it. Anyone know how to get that off the walls?? These are amazing! Can’t wait to re-do my bathroom. I was so excited to see your favorite bathroom makeovers, and then I saw mine in your post! What a wonderful surprise! Thank you so much for including it in your favorites! You’re welcome, Traci! And I’m even going to flatter you a bit more by copying your idea for your walls in my own bathroom makeover. 😉 You know what they say about imitation, right? 😀 Not sure if I’m doing it the same way you did, but I absolutely love that look, so I’m trying to replicate it. Hope it turns out as great as yours! I would absolutely be flattered and honored! I love when we can inspire each other. 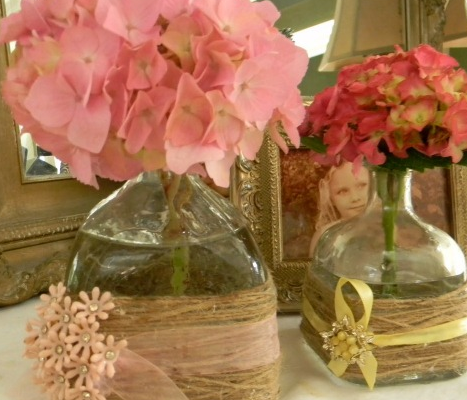 You inspire me with all of your fabulous decorating ideas as well. Great ideas Kristi. They’re all very beautiful and inspiring for all those who want to renovate the bathroom. Also, to finish home DIY projects faster, Bondera Tile MatSet is perfect for tiling. It’s an advanced pressure-sensitive adhesive on a roll that provides an innovative way to install tile, making it faster, easier and cleaner than traditional methods such as mortar or mastic. Hope this information is helpful for all of you that want make bathroom remodeling a one day project. We did a half bathroom makeover but it is still a constant work in progress and I haven’t updated some of the changes since my post on it. Right now we added some new towel bars and are building an extension to go to the right of the existing vanity for more desktop storage etc. I love the one at Beneath My Heart! These bathrooms had pretty impressive makeovers, but it’s amazing to see how only a few layers of paint can actually have a big impact on a room! Sometimes we don’t realize how much potential we have to improve our home if we stop a bit of time and think. Some stunning bathrooms there, gotta say, the best for me is Miss Mustard seed, what a transformation and it just gives the illusion of so much more space. Hi I would love to make over my bathroom and replace the tube with a walk in shower and take out the tiles that are floor to ceiling but after have contractors over i can’t afford the $10,000- $12,000. We were just thinking of changing the fixtures from gold YUK to nickel but i think it needs more. if i took pictures and sent it to you could you give some ideas, i might make a apple pie, but when it comes to decorating the bathroom i am lost. please help. Nothing improves a bathroom redesign faster than replacing the old 70s faux wood cabinetry! if budget is tight they can be stripped with remover, sanded and painted or lacquered. Hi, thanks for inspiration, great ideas for the bathroom. It’s amazing how little decoration changes such as to paint afew stripes on a wall, or add picture frames can totally make over the look and feel of a bathroom. 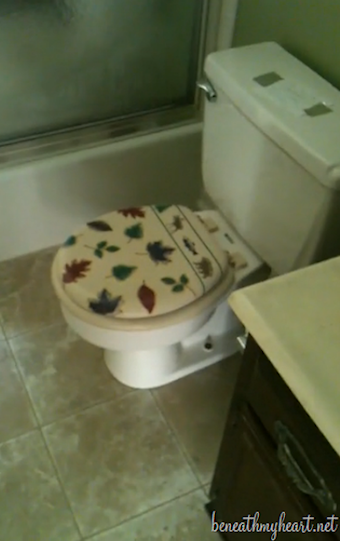 Marvelous bathroom makeovers! Really, your idea is fabulous and inspiring. I love a good before and after! Great job.